This recipe comes to you via a long internet rabbit hole! We were watching the Great Baking Challenge, Holiday Edition, on Netflix. It's the Great British Bakeoff but brought to America, with the addition of judge Sherry Yard. Sherry Yard.. I knew I recognized her name, wasn't she the pastry chef for Wolfgang Puck? So I started poking around, and discovered, yes! She is also the three-time James Beard Award winning pastry chef Sherry Yard. Her Wikipedia page lists her accomplishments and also in a one-sentence paragraph, "Yard has stated that her signature dessert is Kaiserschmarrn. 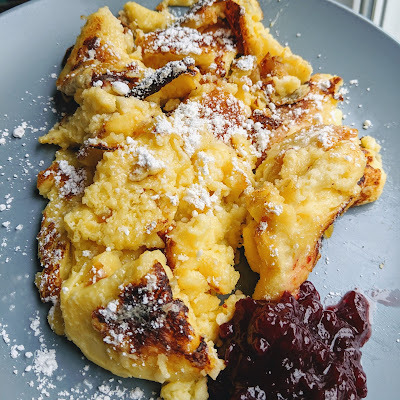 I had never heard of Kaiserschmarrn, so I looked it up, and watched endless videos in German featuring people making it, and it is one of those recipes that people make in a variety of ways. A video in Tiroli claiming to have the original recipe makes it more like a flat pancake which gets broken into pieces. Other recipes separate the eggs and beat the whites, and bake it in the oven more like a souffle. 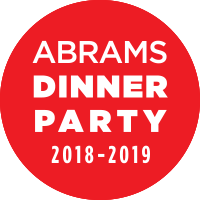 Whatever the technic, it all ends up on the plate in messy pieces, caramelized somewhat with butter and sugar, and served with plum or lingonberry. I am going to start with the recipe from the Austrian National Tourist Office and go from there. Many of the recipes used raisins, and some of them had soaked the raisins in rum. I didn't have raisins, but I did have candied orange peel, so I soaked a few tablespoons in a little bit of an apple brandy we have in the pantry, having no rum either. I'm not sure the dish needs it, it almost distracts from the lusciousness that ends up on the plate. And yeah, it's messy. But it's delicious. Its' closest cousin is probably the pannukakku, the delicious oven pancake from Finland that is more custardy than most German/Dutch oven pancakes. But with added caramelization (meaning added flavor) and more prescribed toppings. Place the raisins and/or dried fruit in a bowl, mix with the rum and leave to stand for approx. 15 minutes. Separate the eggs and place the yolks in a mixing bowl. Pour in the milk and vanilla, and add the flour. Mix to form a smooth batter. Beat the egg whites together with the sugar and a small pinch of salt until it forms a firm peak, and fold into the batter mix. Pre-heat the oven to 350°F. Remove from the oven and arrange on pre-heated plates. Dust with confectioners sugar and cinnamon. Serve with baked plums, a berry or fruit compote. *Because I had seen it made so many ways, I did not turn over the pancake before putting it in the oven. But after 8 minutes it hadn't cooked through. I cut it into quarters, turned it over in messy fashion, and finished cooking it on the stovetop. I do think the oven helps with the rise of the batter. **I just tossed in the pan on the stove until everything was cooked through enough and some parts were browning. I only ended up with one piece that seemed too dark. Over all, the pan I chose didn't quite fit all of the batter, so some adjustment may need to be made (or just leave some out! Like pancakes? I seem to make them from around the world! Check out the Finnish pannukakku, Icelandic pönnukökur, Papua New Guinean banana pancakes, the Danish ebleskiver, the Hungarian palacsintas, the Swedish pancakes from Alaska, and what we call the German oven apple pancake. I also made ratio pancakes from Michael Ruhlman's book, which we can call American. This year because the school year ended so late, and today was the actual last day we were even open, we went with brunch instead. I hemmed and hawed over what to make and ended up with a coffee cake idea. I've had this cranberry buckle on my to-make list for a while, I had 1.5 bags of fresh cranberries in the fridge, and it was just the perfect time. Prepare the Spiked Candied Fruit: In a small bowl, combine candied orange peel, crystallized ginger and orange liqueur. Cover and let stand for several hours or overnight at room temperature. Prepare the Sugar Cookie Streusel: In a large bowl, whisk together the flour and sugar. Using a pastry blender, cut in the butter until mixture resembles a coarse meal. Set aside. Arrange oven rack in lower third of oven and preheat oven to 350ºF (177ºC). Grease 9-inch (23 cm) round nonstick springform pan with shortening and dust with flour, tapping out the excess. If using insulated cake strips, don’t forget to prepare the pan per manufacturer’s directions with the exception of using two (as shown in the article above). Set aside. Prepare the Cake: In a medium bowl, whisk together flour, baking powder, salt and spices until well combined. Using an electric stand mixer fitted with paddle attachment, or handheld mixer and large bowl, cream together butter and sugar until light and fluffy, about 3 minutes. Add lemon zest and vanilla; beat until combined. Add the eggs, one at a time, blending well after each addition on medium speed scraping sides and bottom of bowl as necessary. (Mixture may look slightly separated. Don’t worry. It will pull together with the addition of flour.) Add flour gradually while mixing at low speed until mixture is just blended. Do not overmix. (Batter will be thick and very heavy.) Using rubber spatula, carefully fold in spiked candied fruit and cranberries until distributed evenly. Using rubber spatula, scrape batter into prepared pan. With spatula, spread batter evenly to pan edges and smooth the top. Use hand to clump portions of streusel by squeezing and use fingers to sprinkle small clumps of streusel evenly over top of batter. Repeat process with remaining streusel. Bake in preheated oven until toothpick inserted into center comes out clean, about 55 to 60 minutes. Remove cake from oven and place on wire cooling rack. Immediately, sprinkle sugar over the top of cake and run thin metal icing spatula around edge of pan to loosen cake from sides of pan. This will prevent the cranberries from sticking to the sides of pan and will make removing easier. Cool for 15 minutes. To Unmold Cake: If using, remove insulated cake strips. 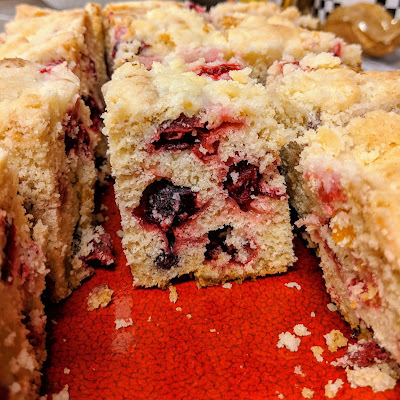 Unmold cake by removing sides of pan. Cool until just warm or to room temperature, about 1 hour. Slice into wedges and serve. Yield: Makes one 9-inch (23 cm) cake, serving 8 to 10. -When I tried to go to the liquor store, there was a sign up that said "Be right back," but it was pouring down rain and I just wanted to go home. So instead of an orange flavor, I used kirsch, since I had some on hand. -I no longer have a working 9" springform so I just used a 9" square pyrex, and that fit the cake perfectly. I did not have any burning issues as described by the original baker. I love peanut butter balls during the holidays, or the regional version known as Buckeyes. But the rolling into balls and the dipping into chocolate is so much work, and messy work. And mine always look knobbly and never neat. 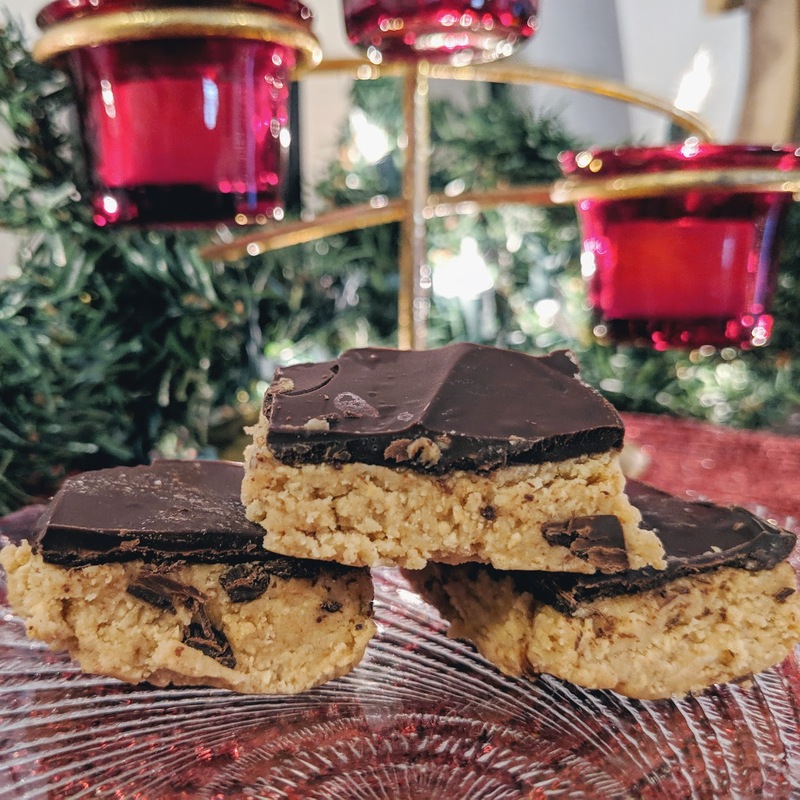 So when I saw this recipe, which is basically peanut butter balls in bar form, I knew I had to try it. Georgia is trying to claim it for itself, but who knows where they really originated. You get slightly less chocolate in this variety, so I added more than what the recipe called for, but then came the difficulty of cutting it into squares. I should have either done it earlier before the chocolate set completely, or used a warmed up knife. So mine are not perfect, but possibly slightly more perfect than the ball form? And to my co-worker who doesn't care for chocolate and peanut butter together, I really do hope I can eventually make something with a different flavor profile this holiday season. Sorry!! Line a 13 by 9 by 2-inch pan with foil. Combine the butter, peanut butter, sugar, and graham cracker crumbs in a food processor. Process until the mixture forms a ball. Press into the foil-lined pan using your hands or a spatula. Melt the chocolate chips in a double boiler over simmering water or in a microwave-safe glass dish in the microwave for 1 minute on high (100%). Stir. If the chocolate has not completely melted, microwave for 10 seconds more, then stir. Spread evenly over the cookie layer with a spatula. Chill for several hours. When ready to serve, allow the candy to come to room temperature before cutting into pieces. Store in an airtight container in the refrigerator. Sorry this is a day late, I hadn't posted it in advance and had no power during an ice storm for 30 hours! Another recipe from our neighbors to the north! When I went poking around for typical Canadian sweets, I came across a lot of butter tart recipes. But I don't have a mini tart pan, and that's a lot of work. So when I came across a few bar cookie (or "squares") versions, I knew I'd found a good idea. 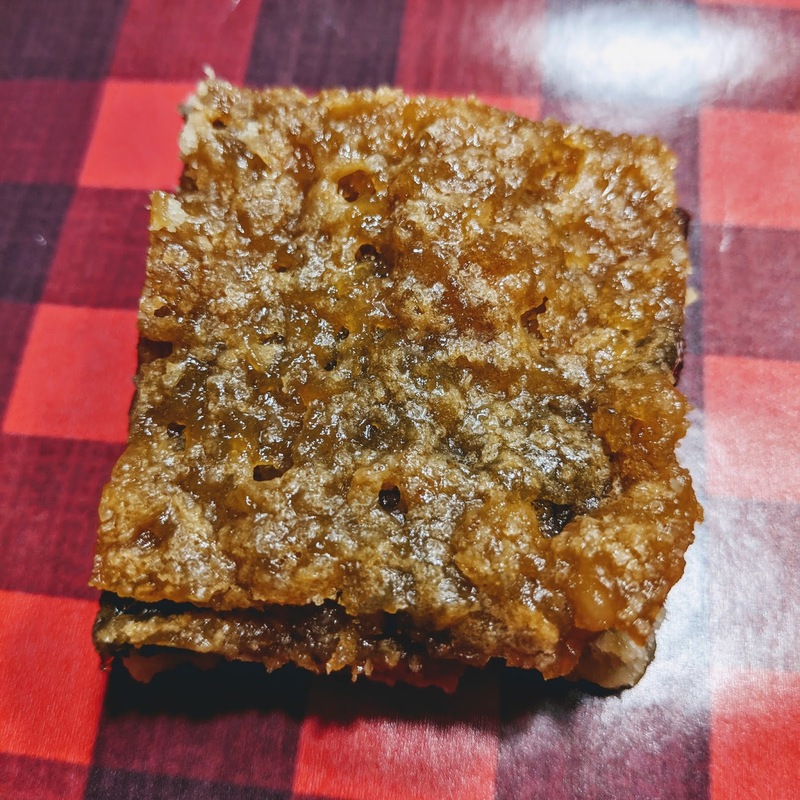 People who received my lumberjack boxes got one butter tart square, and I heard from a lot of people that they liked these a lot. I did too, definitely my favorite bake from December so far. I also discovered the marvelous site that is Canadian Living - kind of like the Canadian version of Sunset Magazine (northwest) or Southern Living (southern) and has great regional recipes. In bowl, mix flour with sugar; using pastry blender, cut in butter until crumbly. Press into 9-inch square metal cake pan; bake in 350 F (180 C) oven for 15 minutes. Filling: In bowl, mix butter with eggs; blend in sugar, flour, baking powder, vanilla and salt. Stir in raisins and walnuts; pour over base. Bake in 350 F (180 C) oven until top springs back when touched lightly, 20 to 25 minutes. Let cool in pan on rack. Cut into squares. This year I'm giving away boxes of sweets that are Canadian or Alaskan inspired. One fun recipe I came across, one I liked more than I expected (as I am not a huge fan of white chocolate.) This is apparently a copycat recipe from something you can buy from See's Candies, but that's not local to me anymore. They were all over when I lived in the northwest. 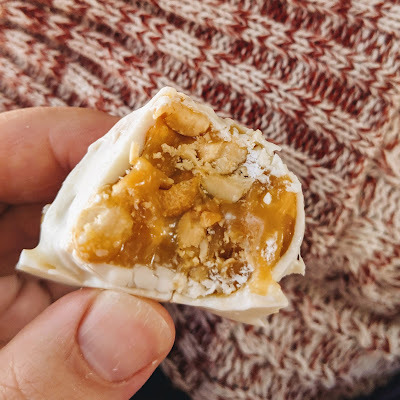 The author of the copycat recipe links to her homemade caramel recipe but since I had so much to make this weekend I definitely took the easy way out of homemade caramel. I ended up making two shapes, some that are flatter, and some that are thicker clusters. 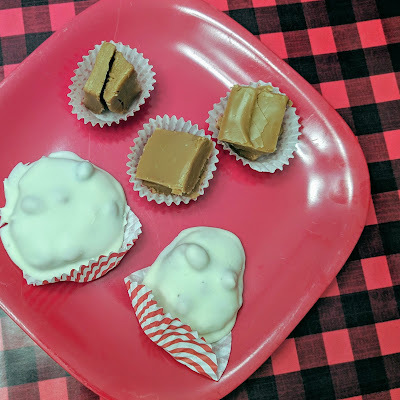 The thicker ones were harder to dip in white chocolate but nicer to bite into, and a better balance of salt (peanuts) and white chocolate (coating.) But it's not as sweet as you would think. Line a large cookie sheet with Silpat mats (or parchment paper) and grease it with butter. Set aside. Melt caramels with butter and cream in the microwave in 30 second increments, stirring, and repeating until smooth. Mix in the peanuts and then let it sit in the bowl to cool for about 15 minutes, stirring every few minutes. Spoon onto the mats in tablespoon size mounds. Place in the fridge for 30-60 minutes until set. Place chocolate in a bowl and melt in the microwave on low in 30 second increments and stir until melted and smooth. Dip caramel cluster in the chocolate and use a fork to remove it. Holding it over the bowl, tap the fork on the edge to let any excess chocolate drip back down. Place cluster back on the parchment lined pan and repeat with remaining clusters. Put the pan back in the fridge for 30-60 minutes until chocolate is set. Remove and package up.